This week I LOVE….personalised drinks! Getting married on a (hopefully) beautiful summers day? Add some flowers to your drinks for an extra pretty and girly touch - of course, don't forget to check which flowers are poisonous, you don't want your wedding to be memorable for all the wrong reasons! You don't have to over complicate this, floral drinks can be as simple as a glass of prosecco with added flowers for that stand out touch. If there's a food or drink that you and your fiancé love then incorporate it into your drinks. If you're never seen at work without a coffee in your hand then why not chose an espresso martini? Or if you're known for your love of spicy foods then add a hint of chilli to your cocktails. Whatever your favourites you can include them in your cocktail, so get creative! Got a silly side? Signature cocktails are a great way to break tradition and do something a little unusual. Your guests will be probably be expecting a glass of champagne, prosecco or maybe even a summery Pimms…so why not surprise them a little with something different to the norm? Iced slushy cocktails are a fab way of keeping guests cool on a hot summers day, and they can look as pretty as this! 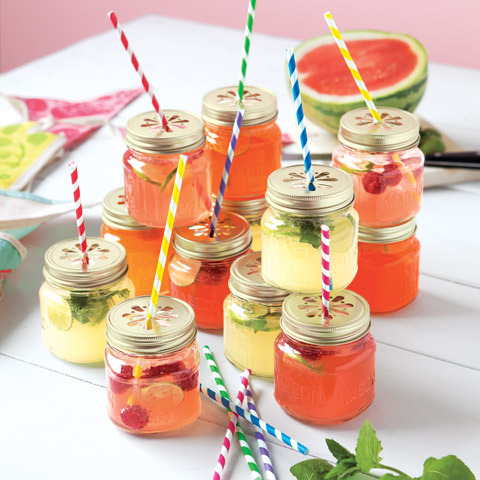 If you're having children at your wedding then don't forget to include a few mocktails for them to enjoy. Juices and lemonades can be easily 'dressed up' to create something fun and child friendly, plus giving children something which has been made especially for them is a great way for them to feel included in your celebrations. You could even include an extra special one for your flower girl or page boy; just choose a different colour juice or add a personalised label. If you have a favourite colour but don't want it to take over your wedding then a signature drink is a fantastic way to bring it in. Now, I know a bright blue cocktail isn't the most appealing looking drink but you'd be surprised at how many different (and tasteful) colours you can incorporate into your drinks. Cocktails can have a bit of a girly reputation, so lets not forget the groom, the best man, your father, the ushers and all the other male guests! There are some great options out there for slightly more manly cocktails, think colours and base drinks.